Thousands of children are affected by school closures in England, Wales and Scotland after more heavy snowfalls. Worst hit is Wales where 600 schools have shut. As much as 5 - 10cm (2 - 4in) of snow is predicted to fall across southern and mid-Wales. Around Bristol 200 schools were also reported to have closed for the day. Other counties affected include Shropshire, Derbyshire, Lincolnshire, Norfolk, Devon, Northamptonshire, Staffordshire, and Leicestershire. Snow has also hit the north of Scotland, where many schools have closed and roads are blocked. In Aberdeenshire and Aberdeen, more than 150 schools are shut. Grampian Police have warned people only to make essential journeys. Powys council said it took the decision to close all its schools after taking weather advice, and to "remove any uncertainty". In the Bristol area, where snow and ice has badly affected roads and public transport, some 200 schools contacted the BBC to say they had closed for the day. Also badly affected is Oxfordshire, where 285 schools have reported they are closed, while across Bedfordshire, Hertfordshire and Buckinghamshire, hundreds are closed after heavy snow falls overnight. There have been scores of traffic accidents and jack-knifed lorries blocking many roads across the area, and the police are advising people not to travel unless absolutely necessary. In Derbyshire and East Staffordshire there are more than 90 school closures. Snow is still falling heavily across the East Midlands. 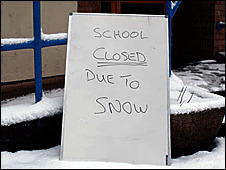 55 of Swindon's schools have closed. In Worcestershire, there is also severe disruption and the council said it was sending out snow ploughs instead of gritting the roads. Headteacher of the Chantry School in Martley, Worcestershire, said heads had a statutory obligation to make sure their sites were safe. "Some are responsible for 1,500 or 1,700 kids, and the staff. "On Monday when we came in and it started to snow, lots of parents were ringing up asking to collect their children early. "We are in a very rural community. We have lots of people who live down hill and dale and it's difficult and can even be dangerous for them to get out," he said. More than 100 schools are closed in Shropshire, and 224 schools are closed in Lincolnshire, where it is also continuing to snow. In Northamptonshire more than 200 schools have closed and there are severe problems on the M1 and other main routes. Across Birmingham and the West Midlands, 395 schools are shut, and all schools are closed in Solihull. On Tuesday Birmingham City Council decided to close all its schools. But on Wednesday it said the decision to close would now be up to each individual school. Radio Bristol reported that snow and ice are crippling schools and public transport. Around 200 schools contacted BBC Radio Bristol directly to say they were shut. And around 80 schools and colleges are now closed in Norfolk due to the snow, with the Kings Lynn and west Norfolk areas most affected. 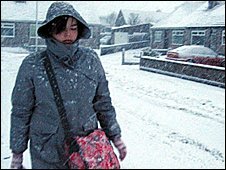 But parents in Devon will be relieved to hear that despite snow falling in the north of the county, just four schools have been closed.